Sure, California may not be the first place you imagine when you think of fall…but the state is home to some of the most magnificent pumpkin patches in the country. It’s actually in the top five states for growing pumpkins. From 40,000-pumpkin farms to patches with over 150 varieties of gourds, you’ll find that perfect pick at these 10 spots in California. More than 40,000 Cal Poly grown pumpkins make up one of the largest patches in California and they’re all only $5 each, big or small. A two-day festival kicks off this seasonal party that’s jam-packed with fun. Highlights are, of course, the pumpkin patch as well as a corn maze, petting farm, hay rides, farmers market, pony rides, live entertainment and the grand finale, a pumpkin pie eating contest. After the festival, just the pumpkin fest continues through the end of the month. Looking for a place to take the perfect selfie with a pumpkin? This is the place! There are hundreds worthy of a photo op in all shapes, sizes, textures and colors. The Irvine Park Railroad is found inside the Irvine Regional Park and the patch is located behind the train station. Family friendly activities at the patch include hay rides, pumpkin ring toss, carnival games, train rides, John Deere tractor rides and a hay maze. There’s an entry fee for the park. Entry to the pumpkin patch is free but activities are extra. Harvest some memories as well as a pumpkin at this family-run farm. Jump on a wagon and take a hay ride to the fields and pick your own pumpkin right off the vine. Stay as long as it takes, the wagon makes multiple trips. Jumbo pumpkins are found in a nearby field, but you’ll need help to get one to your car—some weigh as much as 200 pounds. Admission is free. Pumpkin prices are charged by the pound. Before heading out, jump on the train for an open-air journey around the farm or get lost in a beautiful sunflower labyrinth. Open the last weekend in September through the first weekend in November. Kids will love this experience because it’s kid-driven fun. The patch has a huge selection of premium pumpkins that kids can paint, glitter-up or decorate. Lots of activities to keep little ones busy like a hay-bale spooky maze, candy corn hole, pumpkin bowling, Mr. Jack O’s Jumpin’ bounce house and spooky slide. You can even pick-up a Halloween costume for your favorite trick-or-treater. Open every day in October. Dreamin’ of a homemade pumpkin pie? Find a favorite recipe and head on over to this pumpkin patch to pick up an edible pumpkin worthy of a pie. There are also non-edible pumpkins, perfect for carving or decorating, plus gourds and other types of squash. 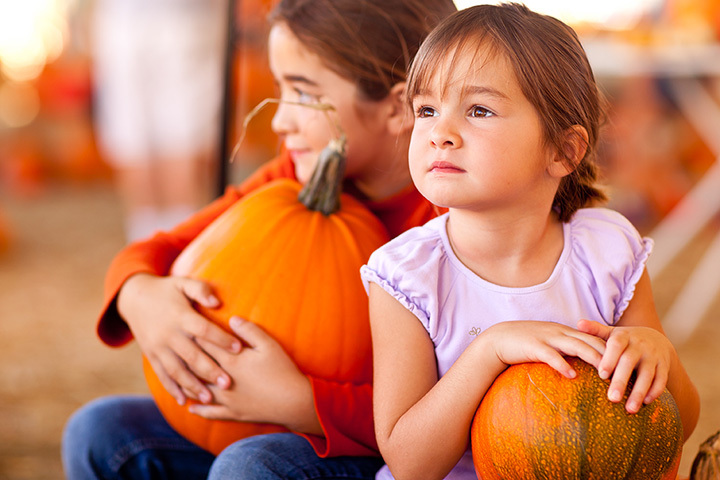 After snagging a pumpkin, take a dip in the corn bath, race a pedal car and jump on a hay ride. If there’s time, don’t miss the corn maze, it holds the Guinness Book of World Records title as largest in the world. Opens in September and runs through the end of October. Mr. Wrinkles. Harris Morgan. Tiny Turks. Flying Saucer. Bumpkin. Bat Wings. No, not characters in a fantasy novel … names of pumpkins. These are just a few of the 150 varieties of pumpkins, squash and gourds available at this patch. They come in a variety of distinctive colors: white, grey/blue, peach, red green, striped and, yes, orange. There’s a corn maze that promises only to take an hour … unless of course you get lost. Hop aboard the cow train for a spin around the property. Snack bar with food and drinks just in case you want to eat something other than pumpkins. Billed as the World’s Pumpkin Capital, this city comes alive in October with an annual festival and fields, throughout the region, awash in a sea of orange. Pumpkins are ready for pickin’ at this patch in October. Overseen by Farmer John, yes he’s real, you’ll find pumpkins from mini-sized to Atlantic Giants that top out at 500 pounds, plus gourds and all manner of squash. Open mid-September through Halloween, seven-days-a-week. For more than 150 years, there’s been something growing on this farm. Every fall, pumpkins make an appearance, dozens of varieties that, like people, come with unique characteristics—big, small, tall, short, red, warty, thick stemmed, white, green and oranges in all shades. Kids will love riding in the buckboard wagons through the 17-acre patch, loading up that back end with their favorites. Take a pony or train ride, hang out at the Lil’ Bug Play Land and scream with glee on the Silver Spur roller coaster. Fall fun-for-all happens at this classic pumpkin patch, a community gathering place that celebrates the season. Take your pick from a full array of pumpkins, gourds, straw bales, and corn stalks and make decorating at this time of year easy. Kids, large and small, will have fun in the bounce house, straw bale maze and riding a pony. Every year, the Great Pumpkin Blood Drive, one on the largest in the state, is hosted here. Everyone who donates bloods gets a free pumpkin. Tons of pumpkins! And if you want, you can buy a ton of pumpkins … that’s how many you’ll find here, an enormous selection of fall’s definitive orange icon. Open the last weekend of September through the end of October, fun is in the air daily at this farm, a 75-year local tradition. Hang out with farm animals, check-out a tractor, sneak through the corn maze and pick a peck of pumpkins—that’s a whole lot less than a ton and easier to get home.